43 doctoral students from 14 countries came to participate in the first International PhD Summer School organised by Department of Research Affairs at Kaunas University of Technology (KTU). The lectures at the three-day intensive course were delivered by the speakers from Czech Republic, the United Kingdom, Latvia and Switzerland. The aim of this PhD Summer School was to develop essential skills needed for writing scientific articles, doctoral theses and project proposals, to provide participants with good networking opportunities. Many new collaborations and friendships started in a friendly social environment at the Lithuanian seaside resort Palanga. “Doctoral students can choose from a wide variety of summer schools. The focus of the KTU’s summer school was to develop and to expand their generic skills. Although writing research articles, doctoral theses and preparing project proposals is an important part of a study process for all doctoral students in all universities, there are not many summer schools focusing on the developing the skills needed for these activities. We are extremely glad that we could get together PhD students from various study fields: they could share, compare and discuss their experiences not only during the classes, but also in the free time. I am convinced that the new acquaintances will grow into collaborations in the future”, said Vita Daudaravičienė, PhD Project Manager at the KTU’s Department of Research Affairs. On the first day of the Summer School Dr Lucie Boudova (Elsevier, Czech Rep.) delivered a lecture on how to write a good scientific article. The workshops by Prof Dr Elina Gaile-Sarkane (Riga Technical University, Latvia) and Prof Dr Dietmar Grichnik (University of St. Gallen, Switzerland) on writing doctoral thesis and articles were delivered separately for the students from social sciences and humanities, and for those from technological, physical and biomedical sciences’ study fields. On the third day Heidi Dyson (Next Level Innovation Ltd, UK) introduced the peculiarities of writing a good proposal for Horizon2020 research funding programme. The organisers of the event are happy to have had very motivated and talented participants. 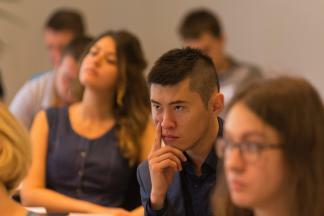 “Our first international summer school for PhD students surpassed all the expectations. The participants were excited to learn from the professional speakers, and we received a very good feedback from everyone. Many people were surprised to find out that this was our first event of the kind”, said Leonas Balaševičius, the Head of KTU’s Department of Research Affairs. Department of Research Affairs intends to organise PhD Summer School annually.